An illustration by cartoonist Jean Veber depicts British Army troops rounding up South African Boer civilians. Image courtesy of the Miriam and Ira D. Wallach Division of Art, Prints and Photographs: Print Collection. Before the first prisoner entered the Soviet Gulag, before “Arbeit macht frei” appeared on the gates of Auschwitz, before the 20th century had even begun, concentration camps found their first home in the cities and towns of Cuba. The earliest modern experiment in detaining groups of civilians without trial was launched by two generals: one who refused to bring camps into the world, and one who did not. Battles had raged off and on for decades over Cuba’s desire for independence from Spain. After years of fighting with Cuban rebels, Arsenio Martínez Campos, the governor-general of the island, wrote to the Spanish prime minister in 1895 to say that he believed the only path to victory lay in inflicting new cruelties on civilians and fighters alike. To isolate rebels from the peasants who sometimes fed or sheltered them, he thought, it would be necessary to relocate hundreds of thousands of rural inhabitants into Spanish-held cities behind barbed wire, a strategy he called reconcentración. Civilians were forced, on penalty of death, to move into these encampments, and within a year the island held tens of thousands of dead or dying reconcentrados, who were lionized as martyrs in U.S. newspapers. No mass executions were necessary; horrific living conditions and lack of food eventually took the lives of some 150,000 people. These camps did not rise out of nowhere. Forced labor had existed for centuries around the world, and the parallel institutions of Native American reservations and Spanish missions set the stage for relocating vulnerable residents away from their homes and forcing them to stay elsewhere. But it was not until the technology of barbed wire and automatic weapons that a small guard force could impose mass detention. With that shift, a new institution came into being, and the phrase “concentration camps” entered the world. These camps did not rise out of nowhere. Forced labor had existed for centuries around the world, and the parallel institutions of Native American reservations and Spanish missions set the stage for relocating vulnerable residents away from their homes and forcing them to stay elsewhere. Far more people died in the camps than in combat. Polluted water supplies, lack of food, and infectious diseases ended up killing tens of thousands of detainees. Even though the Boers were often portrayed as crude people undeserving of sympathy, the treatment of European descendants in this fashion was shocking to the British public. Less notice was taken of British camps for black Africans who had even more squalid living conditions and, at times, only half the rations allotted to white detainees. The order was rescinded soon after, but the damage inflicted on indigenous peoples did not stop. The surviving Herero—and later the Nama people as well—were herded into concentration camps to face forced labor, inadequate rations, and lethal diseases. Before the camps were fully disbanded in 1907, German policies managed to kill some 70,000 Namibians in all, nearly exterminating the Herero. It took just a decade for concentration camps to be established in wars on three continents. They were used to exterminate undesirable populations through labor, to clear contested areas, to punish suspected rebel sympathizers, and as a cudgel against guerrilla fighters whose wives and children were interned. Most of all, concentration camps made civilians into proxies in order to get at combatants who had dared defy the ruling power. While these camps were widely viewed as a disgrace to modern society, this disgust was not sufficient to preclude their future use. During the First World War, the camps evolved to address new circumstances. Widespread conscription meant that any military-age male German deported from England would soon return in a uniform to fight, with the reverse also being true. So Britain initially focused on locking up foreigners against whom it claimed to have well-grounded suspicions. British home secretary Reginald McKenna batted away calls for universal internment, protesting that the public had no more to fear from the great majority of enemy aliens than they did from “from the ordinary bad Englishman.” But with the sinking of the Lusitania in 1915 by a German submarine and the deaths of more than a thousand civilians, British prime minister Herbert Henry Asquith took revenge, locking up tens of thousands of German and Austro-Hungarian “enemy aliens” in England. 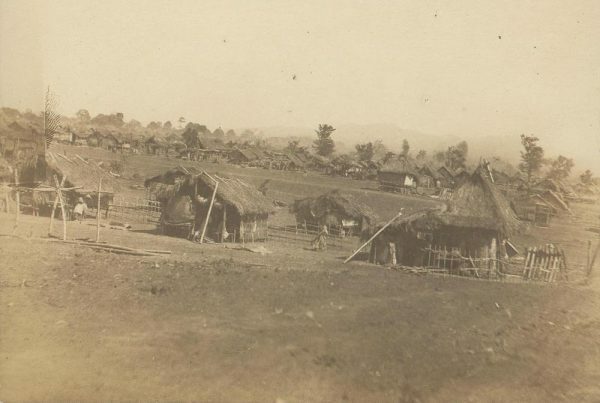 Tanauan reconcentrado camp, Batangas, the Philippines, circa 1901. Image courtesy of University of Michigan Digital Library Collection. The same year, the British Empire extended internment to its colonies and possessions. The Germans responded with mass arrests of aliens from not only Britain but Australia, Canada, and South Africa as well. 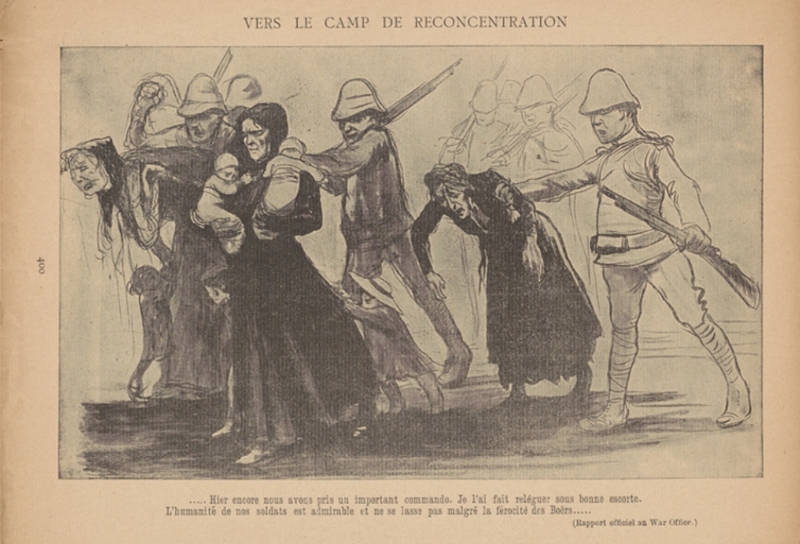 Concentration camps soon flourished around the globe: in France, Russia, Turkey, Austro-Hungary, Brazil, Japan, China, India, Haiti, Cuba, Singapore, Siam, New Zealand, and many other locations. Over time, concentration camps would become a tool in the arsenal of nearly every country. Unlike earlier colonial camps, many camps during the First World War were hundreds or thousands of miles from the front lines, and life in them developed a strange normalcy. Prisoners were assigned numbers that traveled with them as they moved from camp to camp. Letters could be sent to detainees, and packages received. In some cases, money was transferred and accounts kept. A bureaucracy of detention emerged, with Red Cross inspectors visiting and making reports. By the end of the war, more than 800,000 civilians had been held in concentration camps, with hundreds of thousands more forced into exile in remote regions. Mental illness and shattered minority communities were just two of the tolls this long-term internment exacted from detainees. Nevertheless, this more “civilized” approach toward enemy aliens during the First World War managed to rehabilitate the sullied image of concentration camps. People accepted the notion that a targeted group might turn itself in and be detained during a crisis, with a reasonable expectation to one day be released without permanent harm. Later in the century, this expectation would have tragic consequences. Yet even as the First World War raged, the camps’ bitter roots survived. The Ottoman government made use of a less-visible system of concentration camps with inadequate food and shelter to deport Armenians into the Syrian desert as part of an orchestrated genocide. And after the war ended, the evolution of concentration camps took another grim turn. Where internment camps of the First World War had focused on foreigners, the camps that followed—the Soviet Gulag, the Nazi Konzentrationslager—used the same methods on their own citizens. In the first Cuban camps, fatalities had resulted from neglect. Half a century later, camps would be industrialized using the power of a modern state. The concept of the concentration camp would reach its apotheosis in the death camps of Nazi Germany, where prisoners were reduced not just to a number, but to nothing. The 20th century made General Martínez Campos into a dark visionary. Refusing to institute concentration camps on Cuba, he had said, “The conditions of hunger and misery in these centers would be incalculable.” And once they were unleashed on the world, concentration camps proved impossible to eradicate. Andrea Pitzer is a journalist who delves into lost and forgotten history. She is the author of One Long Night: A Global History of Concentration Camps.